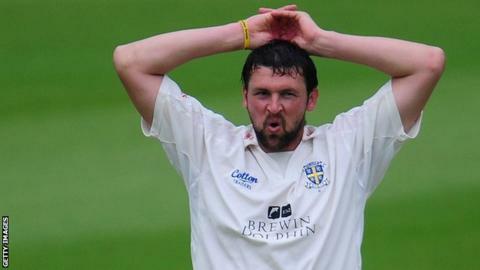 Durham have let veteran fast bowler Steve Harmison join Yorkshire for a month on loan. His arrival will ease Yorkshire's bowling crisis while Ryan Sidebottom is injured and Mitchell Starc is away with Australia. Two-times Ashes winner Harmison has struggled to win a place in Durham's first team this year. The 33-year-old said: "It's been a frustrating season - I don't want to be playing second-team cricket." Harmison has taken only six wickets in three County Championship matches in 2012, but Yorkshire will hope he can rediscover some of the form that once made him an essential part of the England bowling attack. Having worked so hard to lose two stone in weight in the winter, this has been a frustrating summer for Harmison. He's found himself down the pecking order at Chester-le-Street and needs to convince Geoff Cook he still has the sort of form which earned him a four-year contract two years ago. Many fans are rather critical of Harmison and his inclusion in the squad but I am of the opinion he can still do a good job at this level. His arrival at Yorkshire will be a bonus for them - as long as he stays injury free. He played in 63 Tests, taking 226 wickets at an average of 31.82, including a career-best 7-12 in the dismissal of the West Indies for just 47 at Sabina Park in 2004. Up until now he has spent his entire domestic career with Durham after joining their academy as a 16-year-old in 1996, and has gone on to take 736 first-class wickets at an average of 28. Harmison has often struggled for consistency throughout his career but when playing at his peak was considered one of the best fast bowlers in the world. Yorkshire head coach Martyn Moxon said: "We're pleased that Durham and Stephen have agreed to the loan. He still has a great presence on the field and we look forward to welcoming him into the Yorkshire dressing room." Talking to BBC Sport, Durham captain Paul Collingwood admitted his disappointment over the move, saying: "It's a shame we've had to go down that line but I think it's best for both parties. "It's been such a frustrating year in terms of weather. Bowlers gain confidence and rhythm from playing and because there have hardly been any matches, even for the second team, I do feel sorry for them. "Because of the conditions, the 80mph bowlers have almost become more effective than the really fast bowlers, so it's been tough for Steve." However, Harmison insisted: "I'm pleased that I can be helpful to Yorkshire at this point, when they are struggling with their senior bowlers, and I'm looking forward to our first game on Wednesday (against Hampshire)."